As of late, Microsoft’s launch schedule for Surface doesn’t seem to coincide with the industry norms, and that continues with the Surface Pro 6. 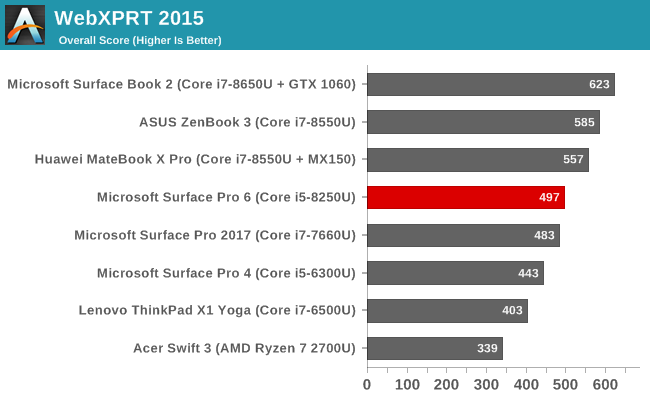 Surface Pro 4 and Surface Book were the launch devices for Intel’s latest Skylake processors, and power management issues with that series of SoC has likely made the Surface team a bit wary about being first out of the gate again. As such, the release cadence doesn’t fall in-line with the normal yearly update as with most OEMs. 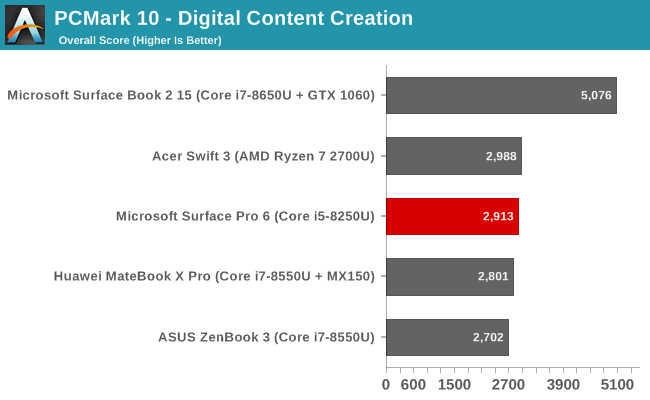 So, it’s a bit delayed, but with the Surface Pro 6 we get our first Microsoft designed convertible tablet with the quad-core lineup of 8th generation Intel Core CPUs, which have generally made a pretty sizeable impact in terms of overall device performance compared to the outgoing Kaby Lake dual-core U series. Microsoft is offering the Surface Pro 6 with either the Core i5-8250U, or the Core i7-8650U, both of which are Kaby Lake Refresh. Intel has just recently launched their latest Whiskey Lake processors though, so once again we see Microsoft updating at the tail end of a generation. The good news this time is that there aren’t significant changes for Whiskey Lake, although the inclusion of hardware mitigations to the Spectre and Meltdown vulnerabilities would have been welcomed. The maximum RAM is still the same 16 GB as seen for a while, and this limitation is due to the maximum RAM size of LPDDR3, which we still see in most low-power PCs. Intel hasn’t added LPDDR4 support to any of their lineup yet with the exception of their Gemini Lake Atom based CPUs. 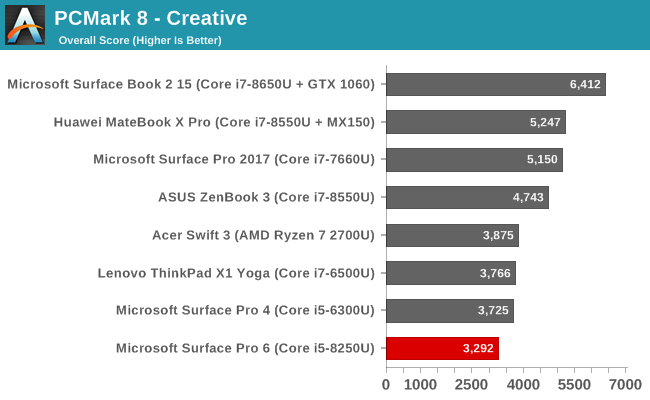 Last year we were able to check out the Core i7-7660U model of Surface Pro, which offered Intel Iris graphics and 64 MB of eDRAM cache, but the Iris model is no longer available in the 15-Watt range, so for this year, at least for now, Microsoft has had to step back to the traditional UHD 620 graphics. Starting with the 2017 Surface Pro, Microsoft removed the fan from the Core i5 model, and that has continued with the 2018 Surface Pro 6, so this is our first chance to check out a fanless Surface Pro as well. 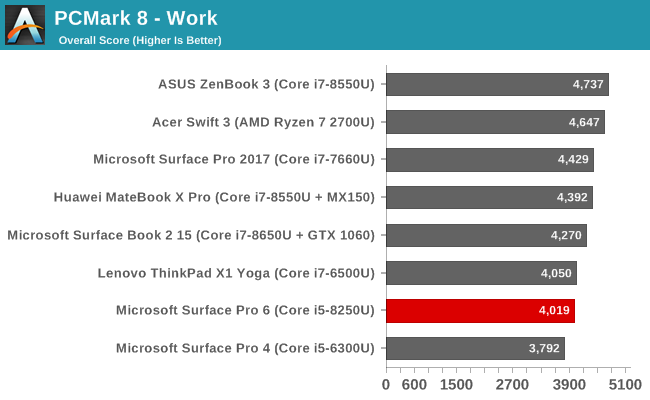 To test system performance the Surface Pro 6 was run through our standard suite of laptop tests. 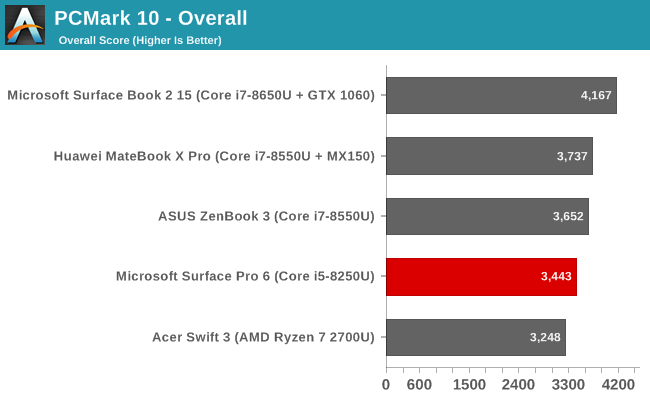 If you’d like to compare its performance against any other device we have tested, please check out our Laptop Bench. 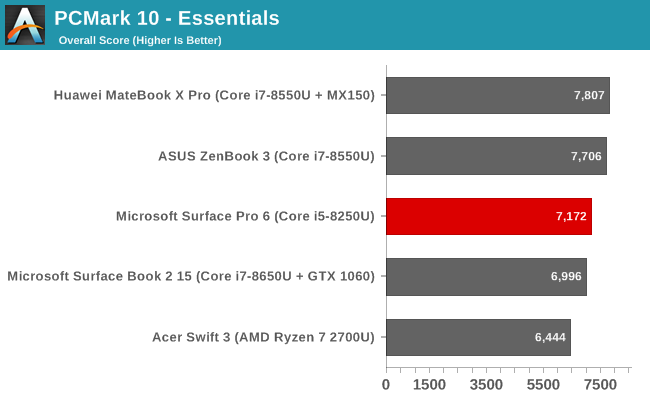 UL Benchmarks PCMark is a good tool to evaluate overall system performance, since it tests all aspects of the device. 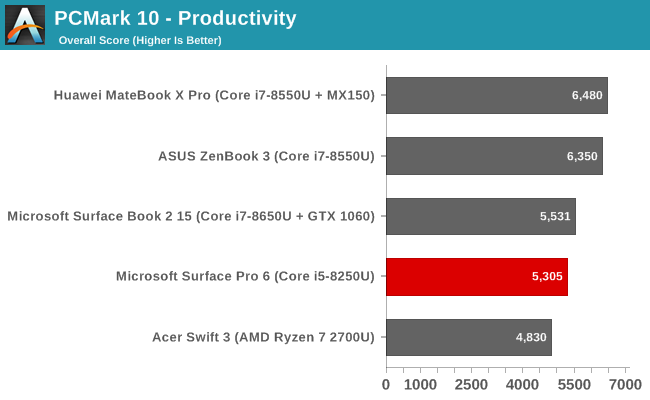 The Core i5 model can’t quite hang with the fastest Core i7 laptops around, but considering it’s the only laptop in the lineup that is passively cooled, it does remarkably well. 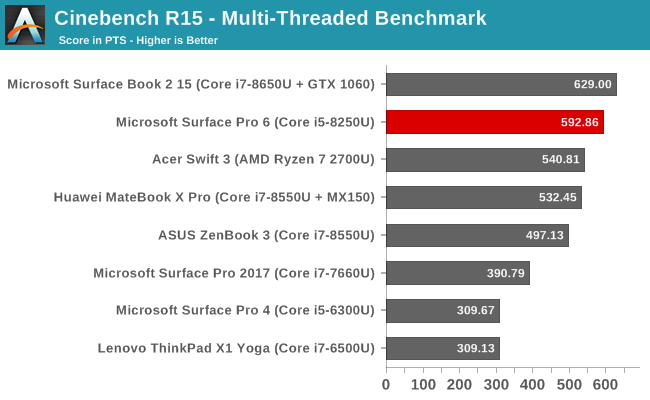 Cinebench R15 is purely CPU based test, and can be run in either single-threaded mode, or multi-threaded where more cores and higher turbo frequencies can really improve overall scores. 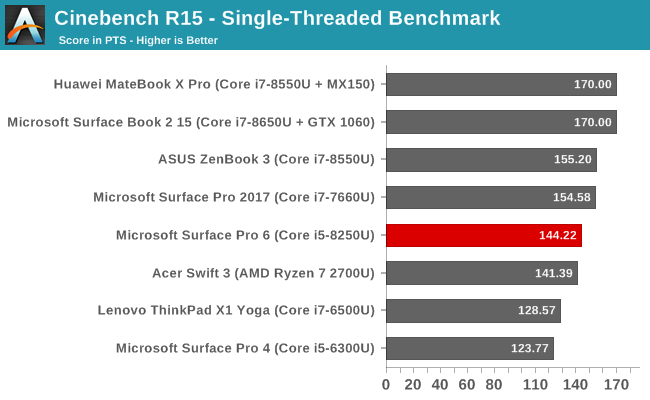 In the single-threaded tests, the Core i5 in Surface Pro 6 is right in the middle of the pack, with it’s maximum boost frequency of just 3.4 GHz compared to a maximum boost of 4.2 GHz in a Core i7-8650U. 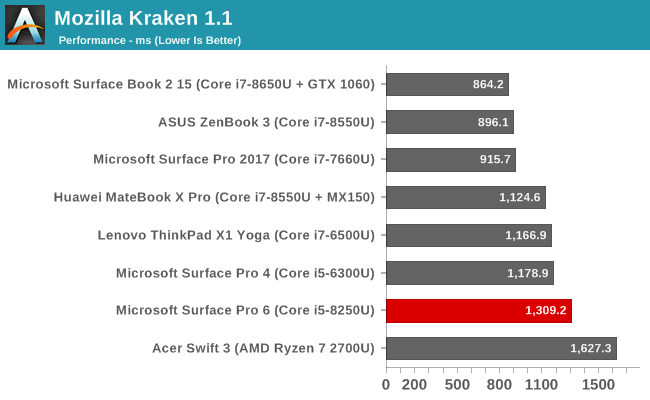 But when you scale up the workload to multiple cores, the two extra cores and four extra threads in the Kaby Lake Refresh processor catapult it near the top, offering 66% more performance than the Core i7-7660U in last year’s Surface Pro. 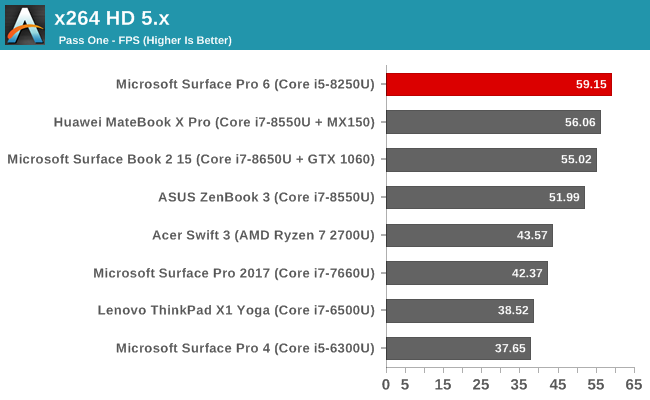 Another CPU test, x264 converts a video using the CPU, and generally scales well across more cores and threads, so the quad-core Surface Pro 6 does very well here, actually outperforming even the Core i7 in other devices. 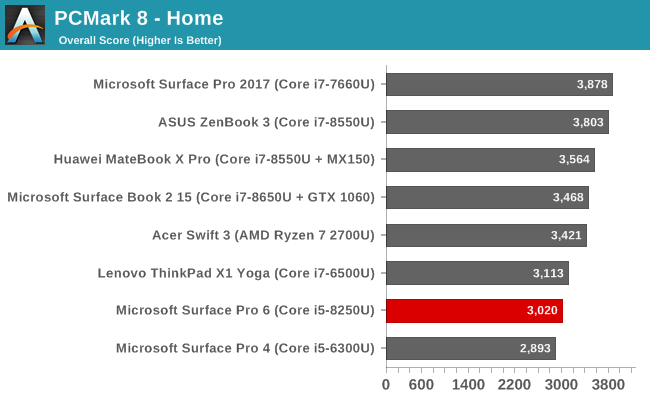 This is also quite a long test, meaning the Surface Pro 6 certainly would have run into its thermal limit, but it still offered excellent performance, meaning the passive cooling system was able to cope. All of our web tests are run using the latest version of Microsoft Edge, and the Surface Pro 6 was tested on Windows 10 version 1803. 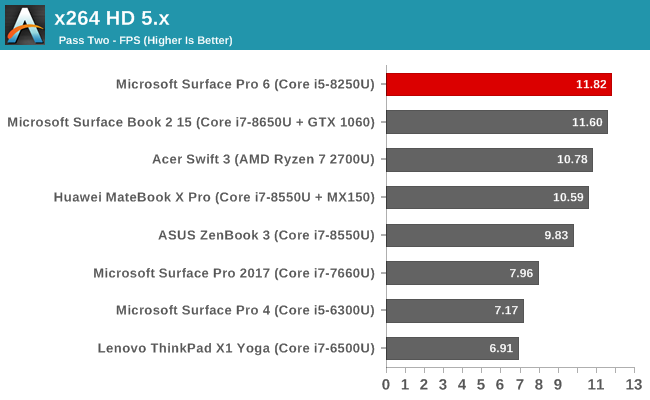 Here the Surface Pro 6’s Core i5 didn’t fare so well, with middling scores compared to the latest laptops around. 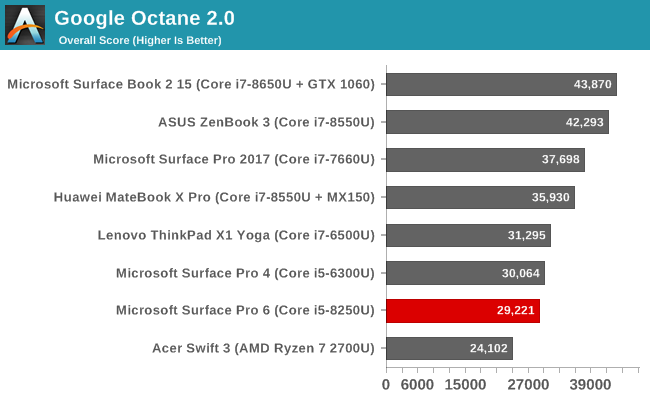 Possibly due to the fanless nature, the PL2 values for the Surface Pro 6 were limited to around 23-Watts, and on other Kaby Lake Refresh devices, it’s not unusual to see 30-Watts for short bursts, and web tests tend to thrive on short bursts of performance. Nah. I have a first gen iPad pro and it's a toy, to me, compared to a Surface Pro.